When William P. Clyde, head of the Clyde Steamship Line, died in his five-story mansion--formerly the home of Andrew and Louise Carnegie--at No. 3-5 West 51st Street in 1926 he left an estate of more than $11.6 million. The once exclusive neighborhood was much changed; now one of business buildings, hotels and shops. Nevertheless, his widow lived on in the imposing mansion which snuggled up against the rear wall of the former Vanderbilt triplex facing Fifth Avenue. 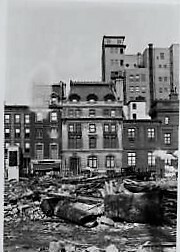 Mrs. Clyde's fatal heart attack in the house on February 3, 1931 sounded the death knell for one of the last private mansions in Midtown. 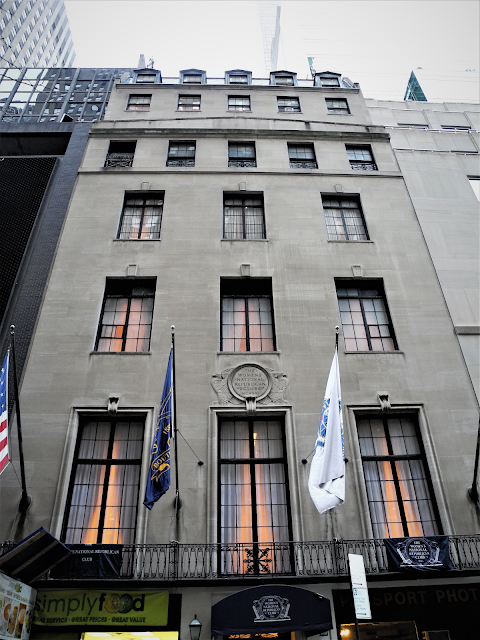 Within five months it was sold to the newly-formed 3 West Fifty-first Street Corporation for $295,000--a considerable amount considering the ongoing Great Depression, equaling about $4.75 million today. At the time the The Women's National Republic Club had its headquarters No. 8 East 37th Street. Founded by Henrietta Wells Livermore in 1921, the club was based on the idea that women--who had earned the right to vote just a year earlier--should fully comprehend the issues and the candidates. Mrs. Livermore's ideals were not entirely without bias, as reflected in the club's name. The Women's National Republican Club sold $300,000 in bonds to pay for a new clubhouse. On February 1, 1933 The New York Times reported that the goal had been reached and construction on the site of the Clyde mansion would be commenced "as soon as permits have been granted by the city." Society architect Frederic Rhinelander King had already submitted his plans. Three months later the mansion was no more and on May 25, 1933 the cornerstone of the new structure was laid by former club president Maude K. Wetmore. The speakers were Republican National Committeeman Charles D. Hilles, and former Representative Ruth Pratt. Among the items placed within the stone were a copy of the United States Constitution, and an American flag. The New York Times took the opportunity to hint at what was to come. "The new building will be eleven stories high and will include thirty bedrooms, an assembly room, to be called the George Washington room, and a library dedicated to the memory of Calvin Coolidge." The Women's Republican Club was completed in March 1934. King had produced a severe neo-Classical structure faced in stone. Sparse Georgian detailing hinted at the 18th century-styled interiors. Despite its otherwise patrician facade, two shops were incorporated at street level to add income to the club. The second floor featured three sets of dramatic floor-to-ceiling French doors, unified by a shallow cast iron balcony. Above the center opening a bas relief disc flanked by eagles announced the club's name and date of founding. A setback at the fifth floor partially hid the uppermost floors from street level, giving the clubhouse a more domestic aura and preventing a detached skyscraper feeling. A postcard revealed the former mansions on either side of the newly-completed complex which would be soon demolished. On March 25, 1934 The New York Times remarked on the prominent figures who would be attending the formal opening--former Secretary of the Treasury Ogden L. Mills; former Secretary of State Henry L. Stimson; Theodore Roosevelt, Jr., son of the deceased President; Senator George R. Fearon; Speaker of the State Assembly Joseph A McGinnies; and others. 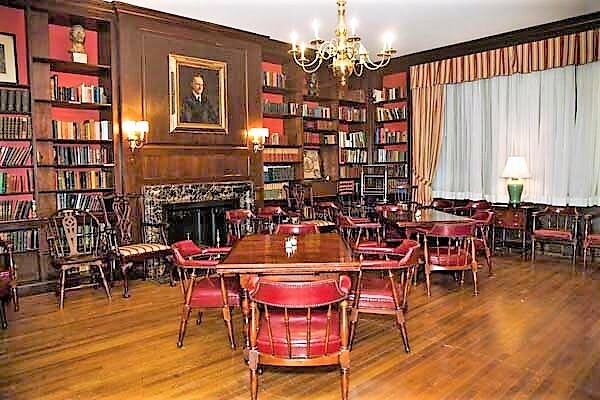 The article mentioned the 18th century furnishings which had been transferred from the former clubhouse saying "they are valued at more than $60,000." There were three floors of bedrooms ("each with a private bath"), dressing rooms for out-of-town members, a main dining room and two smaller private dining rooms. The Washington Assembly Room occupied the full width of the second floor. Here, said The Times, "will be held the club's School of Politics, which attracts hundreds of women each Monday morning." 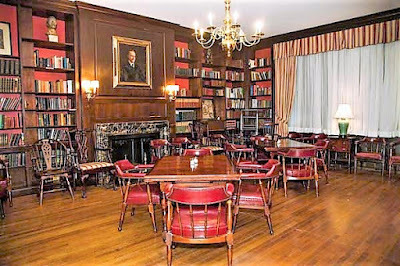 In the Calvin Coolidge Memorial Library on the fourth floor was hung a portrait painted by Wayman Adams a year before Coolidge's death. An amenity for members was the solarium "with red, white and blue wicker furniture." The opening was attended by "several thousand persons," according to newspaper accounts. In her address that evening Mrs. George A. Wyeth proclaimed "The opening of the club marks the rebirth of the Republican party." 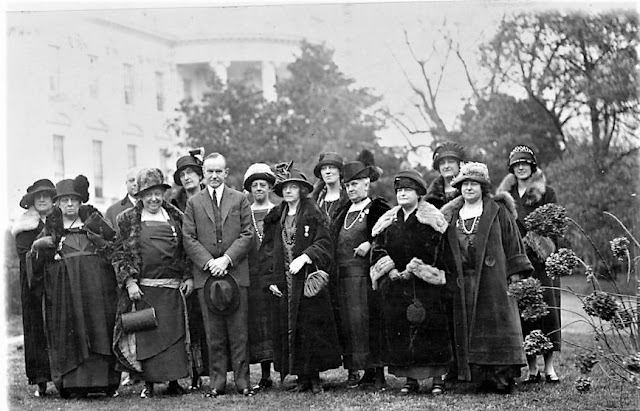 The Women's National Republican Club was never intended to be a social club; however its well-to-do members sometimes achieved their goals through social activities. Such was the case on September 20, 1934. The Times reported "An advertising supper dance entitled 'The Taxpayer's Temptation in Wonderland' will be held at the Women's National Republican Club...to raise money for the Republican Educational League." Debutantes appeared in costumes advertising American products and New York shops. The following summer the club initiated a novel class. 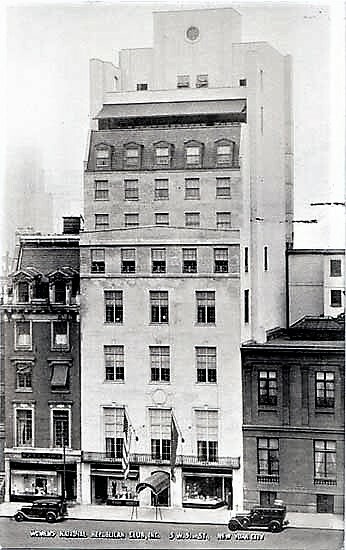 On July 22, 1935 the Rockland County Journal-News reported "In New York a class in political speaking has been opened at 3 West Fifty-first street, the home of the Women's National Republican Club and Mrs. Caraway is confident that before the Autumn is well under way, the other 26 States represented on the national council of the club will follow suit." Mrs. Henry R. Caraway was president of the club at the time. A resident of Carmel, New York she was no stranger to club leadership. During World War I she was president of the Women's University Club and had been president of the University of Chicago Alumnae Association for ten years. As reported by the Bronxville Press on February 21, 1936, she not only gave "fortnightly talks at the club's headquarters" and held "classes for the Republican Business and Professional Women," she "has campaigned extensively throughout the country and is also a lecturer on current political events." Speakers who appeared before the Women's National Republican Club were often fiery and at times more than a bit overzealous in their partisanship. Representative James W. Wadsworth addressed the club on March 26, 1936 to denounce the Democratic administrations's "heavy expenditures and resultant tax program." He shockingly accused Franklin D. Roosevelt of attempting to "establish a dictatorship fashioned after those set up by Hitler and Mussolini." William M. Chadbourne, president of the National Republican Club, was no less dire in his warning to 250 club members on July 16, 1940. He called the current political situation "more perilous than any since the foundation of the Republic--more perilous even than in 1860," referring to the then-impending Civil War. He urged the women to "bend every effort" to put Wendell L. Willkie into office. "If we fail," he warned, "no one knows what will happen." His prediction of doom was echoed by Supreme Court Justice Joseph M. Proskauer, who spoke at a rally in the building on October 29 that same year. Roosevelt, he said, was bent on absolute dictatorship. "There is a pattern by which democracies decay, and dictators, whether conscious or unconscious, good or bad, ride in. I indict the New Deal of using that pattern." Vicious party politics was put aside when the nation was drawn into World War. A month after the attack on Pearl Harbor, Marion Martin, director of the club's women's activities, addressed a group of 150 members. She told the women to cease worrying "about candidates" and begin working for the country as a whole. "The one thing that should be uppermost in our minds is to prove our patriotism by cooperating in the sale of defense bonds and stamps, by cooperating with the Office of Civilian Defense and by doing everything we can to aid the Red Cross and other recognized agencies." Later that spring a dance for servicemen on leave was held in the clubhouse. On the evening of March 27 the Furlough Frolic gave officers of the Army, Navy and Marine Corps. a break from the war. In the post-war years The Women's National Republican Club continued to host lectures, sponsor educational seminars, and classes. Then, in 1974, The Lambs lost its lavish clubhouse at No. 128 West 44th Street to foreclosure. The group of theatrically-involved members moved into Nos. 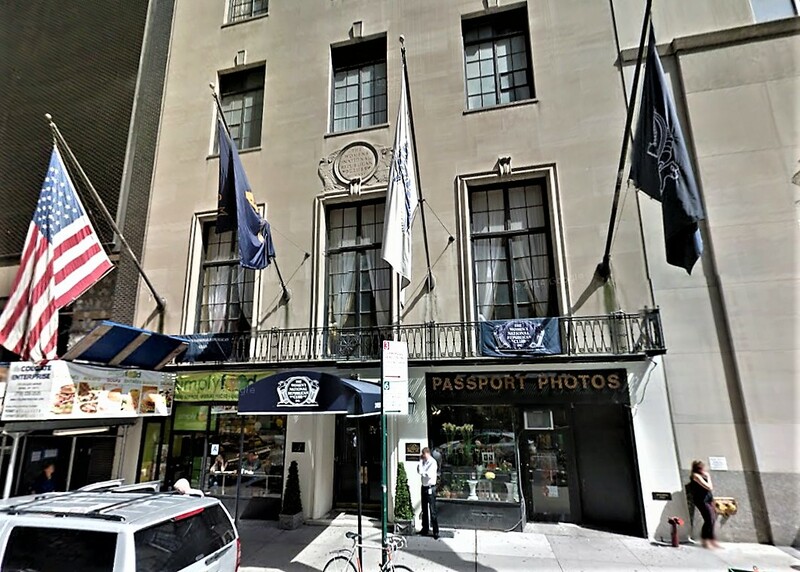 3-5 West 51st Street with The Women's National Republican Club. More of the building was shared when the top floors--once the bedrooms for members--were converted to the 3 West Club, a boutique hotel. Despite the mostly shuffling inside, the exterior of Frederic Rhinelander King's stoic limestone clubhouse remains unchanged--worthy of inclusion on the National Register of Historic Places in 2012. In one of the service staircases, you can find a wall with 8x10 framed photos of all the former presidents of the club. Nearly all of them are glowering at you like an angry nun with a ruler. In checking the websites for the Republican Club, The Lambs, and the three West Club, I am at a loss to understand who currently owns and controls the building. Only on the Lambs page is there the faintest hint the building is shared.